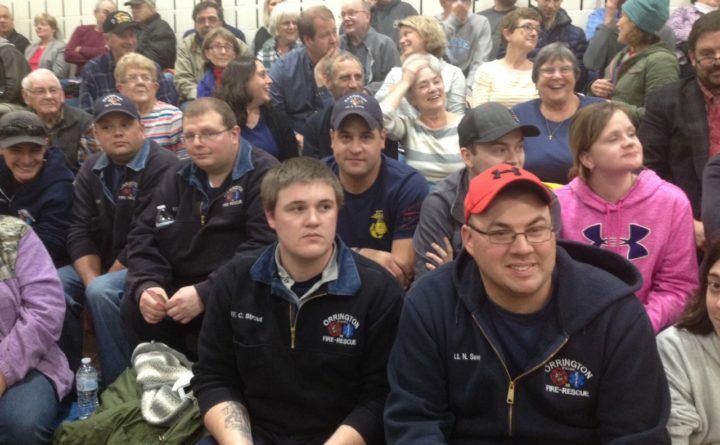 Members of Orrington Fire & Rescue sit together Monday night on the bleachers the gym of the Center Drive School for a special town meeting. An overflow crowd turned out for a vote on a new $3.5 million public safety building. 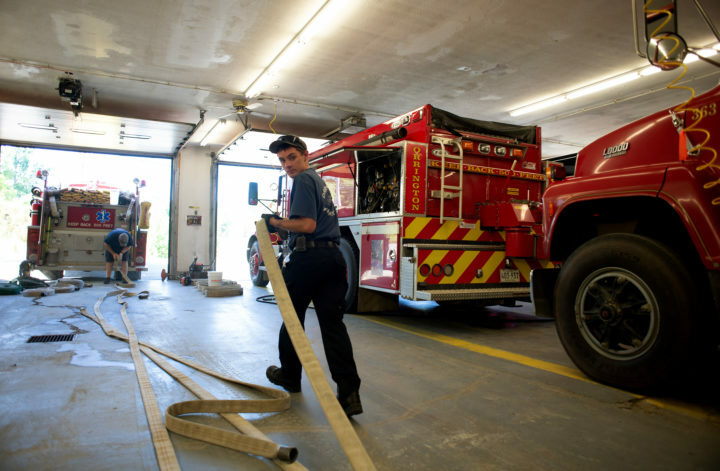 ORRINGTON, Maine — Residents on Monday rejected a proposal to build a new $3.5 million public safety building by a vote of 255 to 234 at a special town meeting. As the meeting began about 7:45 p.m. at the Center Drive School, residents voted overwhelming to cast their ballots without debate. A majority then agreed to vote by secret ballot instead of by a show of hands, an indication of how controversial the issue is in the community. 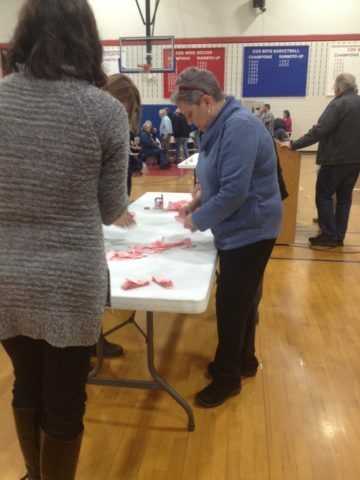 Voters placed a small pink piece of paper that simply read “Yes” or “No” in a large, wooden ballot box. A majority of voters left after casting their ballots and before they were tabulated. The results were announced about 9 p.m.
Keith Bowden, chairman of the Board of Selectmen, said after the vote that the board would meet next Monday and most likely appoint an ad hoc committee that would bring some less expensive options to the community. Bowden said members of the new group most likely would include local contractors who have experience with the build and design method of construction. Orrington residents gathered for a special town meeting Monday night at the Center Drive School for a vote on a new $3.5 million public safety building. Under the town’s charter, a special town meeting on the public safety building proposal cannot be held for 120 days, which would be in early April. Fire Chief Scott Stewart said he was disappointed in the result of Monday’s vote. He said the closeness of the vote showed how divided the community has become over the proposal. The proposed plan for a combined public safety building not to cost more than $3.5 million would house the town’s now separate police office and fire department building, which contain health hazards and code violations. The proposed 13,000-square-foot-building would be constructed at the corner of Center and Tupper drives. The proposal would not impact the tax rate, as it would be funded from the combined municipal building reserve account, the tax increment financing account and the undesignated fund balance, officials have said. The town originally planned to hold a special town meeting on Oct. 23 but could not do so because selectmen never received a warrant to sign, Bowden said last month. At the Oct. 22 selectmen’s meeting, petitions signed by 92 registered Orrington voters were presented to the board that asked that the vote be put off so less expensive options could be considered. Bruce Gray last month told selectmen at their regular meeting that residents wouldn’t approve the $3.5 million price tag for the building.